Our plan was to tow the Airstream across the Bay and into the hills above Oakland to Chabot Regional Park, a campground we’d heard about through another Airstreamer’s (Rosiestreams) Instagram feed. Originally, we’d planned to head over there after a weekend of camping with friends on the coast, but when that had fallen through we’d ended up just camping in our own driveway for two nights which, as it turned out, was not a bad way to get familiar with the new routines of having two children in the trailer. Despite numerous “oh yeahs!” over the past days which had sent one of us scurrying out the trailer door, across the driveway and into the house to grab some overlooked essential we’d neglected to pack, we both agreed that there was still too much to be done on Sunday morning for us to get on the road early enough to make it across the Bay in time to put Wynne down for a nap. Instead, we opted for a more leisurely morning, tag-teaming last minute tasks while shuffling the baby and toddler back and forth. While that day we were only planning to drive about an hour and a half to a local campground, pulling out of our driveway this time would have particular significance. As of late, we’d been struck by an outbreak of wanderlust. Whether in search of the simplicity of space, schedule and location we’d experienced while spending 100 days on the road in the Airstream the previous year or in realization that we’d likely not be this flexible to travel for the next, oh, 18 years or so, we’d been feeling a need to hit the road. Of course, we’d also been working hard on our property just outside of Petaluma for three years since returning from our 5 month honeymoon drive from California to Panama. After that time mending fences, battling weeds, tending animals, planting gardens and generally making up for years of neglected maintenance, a break from the yard work and even the weight of a houseful (and garageful and barnful) of *stuff* – particularly in light of a new baby and an increasingly challenging toddler - was sounding pretty good. For us, “nesting” while waiting for little Mae to arrive took the form of daydreaming about the places we might go. Our planning sessions usually involve the 4x8’ whiteboard in the office, but this time relied on the back of a sheet of recycled printer paper where we scrawled out our priorities and attempted to fit them into a dream itinerary. First, where would we like to go most if we could leave right now? Alaska was the answer for both of us, and we’d already been renovating our 25’ Airstream with it in mind for almost 6 months. Since Mae was due in July, we’d have been too late in the season to go this year, so Alaska was given a spot in May of 2015. Second place we’d love to go? Europe, but not just for a couple weeks. We wanted to be there for an extended period of time, possibly “slow-traveling” from city to city, country to country, and the list of those countries we wanted to visit was *long. * That one seemed a little better to do in a couple years when kids could at least play with some locals in a town square and possibly even absorb a little language. Stick a pin in that one, and we’ll come back to it. Next priority was getting to the East Coast to spend time with Ann’s family, visit friends and see the parks. We wanted to try to find a campground on the beach on the Cape, explore the White Mountains in New Hampshire, camp the coast of Maine. Heck, we wanted to keep heading north into Nova Scotia and Prince Edward Island. We’d also been drooling over pictures on Instagram of the Upper Peninsula of Michigan (or is it Minnesota, guess we’ll have to go there to figure it out). Okay, that sounds like another Airstream trip, and it wouldn’t make a lotta sense to drive all the way over there and then back to Alaska when we could hit Alaska first and then diagonal southeast through Canada to the Great Lakes on the way East. We were ready to start traveling now and didn’t want to wait until a fantasy plan starting May 2015. A friend’s wedding in Cabo San Lucas in October reminded us that another friend had a house in the cute Baja town of Todos Santos, only an hour away. After a few emails, we were able to secure it for the two weeks before the wedding for just the cost of cleaning. That would be three months after the baby was due. 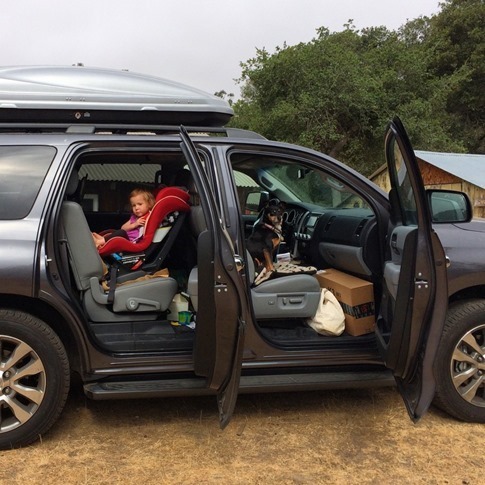 If we gave ourselves 6 weeks for some adjustment to being a family of four, we could squeeze in a 6 week trip in the trailer before heading south. We’d opted to drive the coast of Oregon while heading north towards Banff last summer and had heard great things about Ashland, Crater Lake, Bend and Eugene. Done. And despite the promise of a Thanksgiving visit in Fall of 2015, we wanted to get to New England to see Ann’s family this year with the new baby so why not head there for a month at Christmas? That would mean spending this Thanksgiving with my family who usually goes up to Lake Tahoe. Okay, Tahoe for the month of November. So you’ll forgive us, perhaps, if we decided to leave for this short drive across the bay - a drive that symbolized to us the beginning of a 6 month nomadic period and possibly much more - a little later in the afternoon. It was a bit ironic perhaps, that our departure was partially postponed so we could fill brown paper bags with the nearly ripe peaches, apples and pears dripping from the trees we had worked so hard over the last three years to plant, prune and protect over the winter to finally bear this very fruit. It may have been me prematurely hitching up the trailer that ultimately woke Wynne up from her nap at around 3:30, but we really did need to get on the road soon. Unfortunately, Mae was still napping, swaddled tightly and bobbing gently in a bouncy seat set up in front of two folding camp chairs beside the trailer in our driveway. With the hitch secured, I worked around the trailer, buttoning up the various compartments, removing the wheel chocks that scissor between the tires and double-checking the bikes on the newly installed bike rack. When Mae finally stirred, it was 4:00, and I slowly pulled the trailer down off of the precarious stacks of wood that keep it level in our driveway. Of course, the same thoughtful mother who had guarded those last minutes of her nap also knew that the little one would need to eat before a long drive. It wasn’t until 4:30 that everyone was fed and buckled into their seats and we were rolling out the front gate, destined for the freedom of the open road. “You know, the smart thing to do would be to grab dinner now so we’re not all famished when we get there.” Okay, one more stop for some burritos and then life is a highway! A highway filled with traffic… Then from the backseat, “I have to pee pee.” We got off at the first exit south and looped into an industrial area where we could park the trailer for a pee pee break. 5:30 and we were rolling again. This time, nothing could stop us. Water intake was restricted and all future claims of impending pee pee (and there were several) were unceremoniously dismissed. “I have to poo poo.” Now that’ s different situation. Code Brown! After a few tense miles, we were able to find an exit where we could pull over along a waterfront bike path. Unfortunately, despite our best efforts, we were unable to downgrade the threat level. Following the frontage road along the water, we took the next onramp only to find ourselves being funneled towards the Bay Bridge that would take us into downtown San Francisco. Towing a 25’ trailer. On a busy Sunday. With a Code Brown in effect. Thankfully a final exit before the toll booth saved us, and we were able to swing around and get back on track. Why everyone seemed to think that getting in front of the Toyota Sequoia towing a 25’ Airstream by passing on the right at the last second before the merge would somehow be advantageous to them in bumper to bumper traffic, I don’t exactly understand. I uttered my fair share of disparaging remarks about a few of their mothers before we finally saw our exit on the horizon, and just as I was put on “heightened awareness” of the Code Brown status from the back seat. I pulled in at the first gas station I saw off 35th St in Oakland and immediately felt like I was driving in slow motion as each sketchy-lookin’ dude in the place looked up and panned his head one by one as we pulled along side the pumps. Even the two guys peeking out from behind a mattress leaned up against a tree across the street stopped whatever they were doing that had been producing a menacing cloud of smoke to check us out. Ann took her turn in the trailer with Wynne while I filled the tank and kept my head on a swivel, flashing back to a brief period in which I had access to PlayStation loaded with “Grand Theft Auto.” Soon, Mae began to express her displeasure with being confined in the car seat, so I switched assignments with Ann, immediately offering bribes of chocolate, brown sugar, maple syrup - anything I could find in the cabinets – to get Wynne off the potty and us the hell out of there. But as we climbed up into the hills from the freeway, commenting that while the Sequoia was obviously working – any vehicle that wasn’t working a little pulling 6,500 lbs straight up a steep grade would be way too much vehicle the rest of the time – it felt solid and was getting the job done. At the top of the hill, a sign showed 6.5 miles to the Anthony Chabot Family Campground, and we suddenly found ourselves surrounded by a thick Redwood and Eucalyptus Forests. The highway, traffic, pungent smoke of unknown origin all seemed to disappear with each curve on the bumpy, narrow road. We pulled through the deserted ranger kiosk at 7:30 pm and made a stop at the dump station. The trailer had been sitting, and we needed a fresh start for the week. Black and gray water were dealt with quickly, but fresh water would not be so easy. I’ll have to ask some other large trailer owners about this, but our fill valve is on the opposite side from the dump valves. That wouldn’t be too much of a problem with a regular hose spigot, but a lot of the fresh water fillers have bizarre non-standard nozzles and 45 degree bends that prevent any secure connection. Despite the few tricks I had up my sleeve including a must-have dongle aptly called “The Water Thief,” I ended up having to back the trailer into the road on the opposite side of the dump station. As the last sun faded in the thick tree cover, I sat in the dark on the wet curb beside the trailer holding a nozzle with a flow rate about the speed of a maple syrup tap into the fresh water filler neck while texting my status to Ann who was tending to two overtired children in the car 20 feet away. Living the dream, huh honey? If a train left Houston at 5:49 pm traveling 45 miles per hour and another left San Antonio 15 minutes later, I’d have an easier time figuring out what was for dinner in the dining car than I was having figuring out how to arrange two sets of 10 Lynx leveling blocks to boost both axles on the right side of the trailer 5 blocks high. In my defense, that’s a really unlevel site, and I was performing the whole operation in the dark and without a spotter (mine was inside getting everyone into pajamas while listing heavily to starboard half the time and being jostled around the other half). I finally came up with a structure that would put the rear wheel on 5 blocks and the front on 4 and managed to drive my family up onto it after about 45 minutes. I opened the door and walked up the steps into the trailer at 9:00 pm, four and a half hours after leaving home for an hour and a half drive, and was greeted by a well-rehearsed “Thank you, dadda!” as I groggily walked towards the fridge for my less-meaningful but still much anticipated liquid reward. That first day had put our wanderlust to the test. We’d already come to understand that our free and easy days riding tandem on a motorcycle through the Rockies or flopping into the rooftop tent after a long day on the Pan American Highway were over, although I will say that there were striking similarities between driving in Oakland and Tegucigalpa. 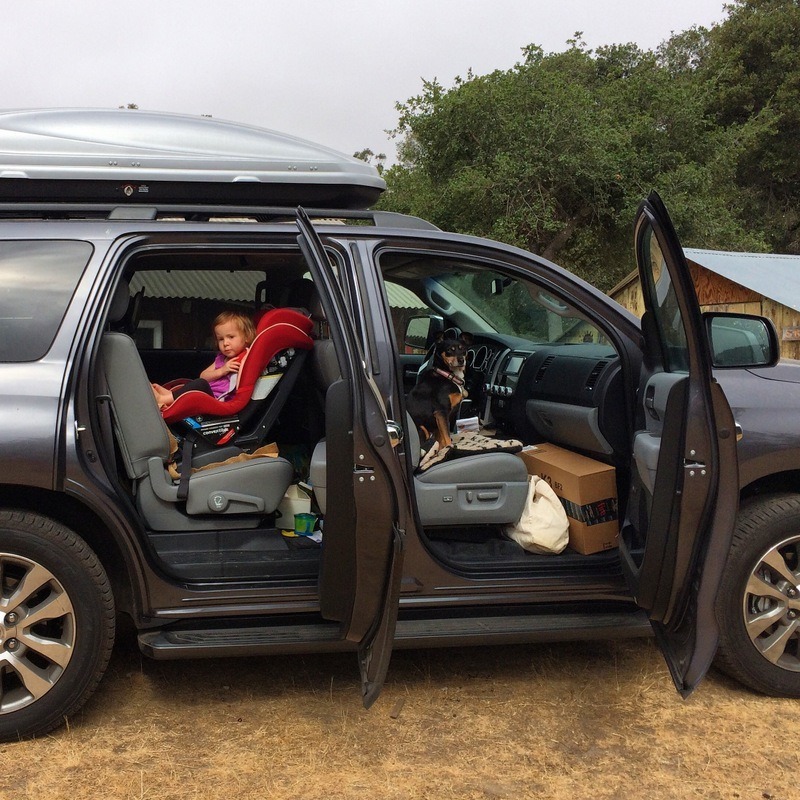 As good travelers we’d come to understand that the journey is part of the adventure, and as good parents we’d come to expect anything and be ready to laugh about it (except Code Browns, that’s some serious $h!t). But as soon as we’d put the kids to bed, and were settled down on couch recapping the day, we felt at home. Of course, this 25’ trailer into which we’d been putting hours and days and months of thought, sweat and sawdust pretty much had all the comforts of home, but that wasn’t it. For the time being, we’d stripped ourselves of much of the day-to-noise that can develop a real sense of urgency - straightening the house, getting the car washed, cleaning out the garage – and returned our focus to the most important things – family, health, food, shelter and experiences. These are the things that make someplace feel like home. As it turns out, they also happen to be some of what I think makes for the best travel. And between shuffling kids, bathroom breaks, burritos, tilted campsites and a supermoon peeking between tall Eucalyptus trees, I’d say today ended up being a pretty good mix of both.